Call for Core Board Members! Have you been wanting to get more involved with SWE-ECI? Now is the perfect opportunity! As this Fiscal Year comes to an end, we will now begin our Call for Core Board Members! We have many positions available to run for all of which you can see below with descriptions. The commitment to being on Core Board is attending monthly Core Board meetings, the responsibilities below, and attending/supporting SWE-ECI. NEW THIS FY- Elected positions are those that are specifically defined in our bylaws and are highlighted below. Our nominating committee will be reviewing all applicants and ensuring we have someone for each role. If there is a missing position, the nominating committee may contact you to see if you are willing to fill a different or additional role. If you are interested in an appointed position (traditional ones outlined below as well), you can also fill out this form. There will be no election for these positions and they will be confirmed by the FY18 core board once they are elected! IMPORTANT NOTE: All elected officers must be dues paying members of the Society. Please visit here for more information on becoming a paid member. Committee chairs and other appointed positions need not be paid members. Additionally, only dues paying members will be eligible to vote for the elected positions. "Face of SWE-ECI"- provides strong direction, clear communication goals, and energizes CB (core board) and the section with enthusiasm. Leads Strategic Planning for section activity; finalizes fiscal year plan. Assists and facilitates all events/section responsibilities where needed. Runs Core Board meetings; delegates Newsletter article writing. Builds networks and relationships within community and with contacts at local engineering companies. Actively works to recruit new members. Makes an effort to attends/support all section events. Lead organizer for 1 event. Will take over for the president if necessary for the remainder of this FY and also fills in at meetings or conferences if the president is unable to attend. Contributes strong ideas; demonstrates support and enthusiasm. Assists President with tasks (overflow); builds close working relationship. Maintains and updates SWE Google calendar to reflect upcoming section event dates/times. Makes an effort to attend/support all section events. Attends conferences as able or if necessary to fill in for president. "Money keeper" - safe keeper of all financial activity and SWE assets; keeps tabs on funds status and money related interfaces. Drafts the fiscal year budget w/ the President and President-Elect for review by the Core Board. Maintains financial records throughout the year against the budget. Handles section reimbursement policy and takes care of reimbursements to section members. Submits Financial Report to SWE HQ on time. Maintains PO box; renews and checks periodically. Brings cash box to events where money gets collected. Maintains calendar with due dates for financial responsibilities and notifies President when dates are upcoming and items are submitted. "Liaison with Region H leaders and SWE HQ"- knowledgeable and/or interested in SWE's larger network, proactive communicator. Submits section reports on time. Attends SWE Region H Conference Calls; reports information back to the Core Board. Votes on behalf of the Section; encourages section to vote. Represents SWE-ECI @ HART and WE15 and Region H Conference (in person meetings). Maintains calendar with due dates for section reports, region calls, and SWE conference dates. "Voice of SWE-ECI" - Assembles and sends out monthly newsletter and maintains SWE-ECI website. Prepares and sends out the Newsletter each month; ensures assigned articles are written. Maintains and updates SWE-ECI Website. Maintains and updates SWE Google calendar to reflect upcoming section event date/times. "Marketer and Social Media Guru" - guides the "image of SWE", has an eye for marketing, skilled at getting information out quickly in a way that gains interest; channels enthusiasm via communication tools. During event planning – seeks information about events. Creates or delegates creation of a “flyer”. Markets each event at least 2 weeks prior on Facebook, Twitter, & LinkedIn by posting event details. Makes an effort to get other Core Board members and people within the section to get an “online chatter” going prior to event. Posts pictures and an event highlights to social media after an event takes place. Passes information to other networks (RC, Societies, etc.) to market our events. Maintains/updates SWE-ECI brochure, business cards, etc. Maintains list of communication “channels” and contacts through which information about events can be pushed. "Recruiter" - outgoing, understands SWE's value and enthusiastically talks about it with others, seeks out ways to/interested in how to increase membership and involvement. Maintains membership database by pulling section reports at least quarterly and comparing to/updating with SWE-ECI database. Responsible for up-keep and growth/direction of SWE-ECI database. Expands SWE network by attending other organizations events or other events that may have potentially interested SWE members. Actively works to recruit new members by talking about SWE actively and inviting anyone to SWE events. Assists President with recruiting events at local companies. Creates evaluations for events to better understand what members are interested in. Maintains and updates email list. Note: These positions can have 2 chairs. Many lend themselves well to it. "STEM Go-To" – passion for STEM and outreach, creative, proactive communicator within SWE and out of SWE to STEM connections; positive and persistent! Organizes 1 unique SWE-ECI STEM outreach event per year (this event may or may not be with the Girl Scouts). Coordinates SWE participation/assistance with at least 2 other k-12 STEM local outreach events. Builds relationship with the Girl Scout community; seeking partnership opportunities. In the know and communicates about any STEM outreach events within the area; recommends and encourages SWE-ECI participation where appropriate. Recruits volunteers for SWE-ECI STEM Outreach events. Maintains contact list for STEM. Attends/supports section events as able. "The University of Iowa Liaison" – familiar with The University of Iowa SWE, approachable and supportive; a positive role model and proactive communicator. 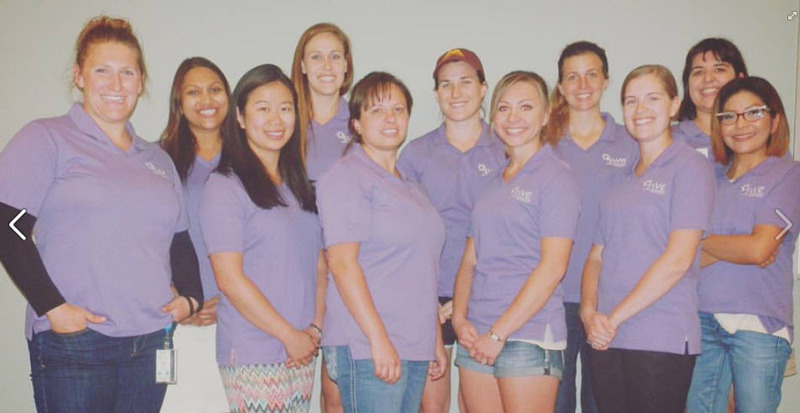 Organizes 1 upgrade event with U of Iowa SWE seniors. Coordinates SWE ECI involvement in U of Iowa SWE’s HS Conference. Coordinates meet up at Annual Conference/Region H Conference. Looks for other opportunities in which SWE-ECI can partner with, mentor, or otherwise assist the student chapter. Communicates with contact at Girl Scout Headquarters to reserve event space, advertise event, get keys etc. Selects and plans activities, creates supply lists, maintains event budget. Responsible for the following (may delegate): purchasing supplies(including badges), printing agendas and handouts, ordering lunch, recruiting and communicating with volunteers, set-up, execution, and tear-down for the event, GS and parent evaluations. Desirable that this person has attended at least one past GSD event. Attends Core Board Meetings as needed (likely those leading up to the event). Keeps SWE connected with other professional societies like SHIP, NSBE, CREW, and women's networks at local companies. 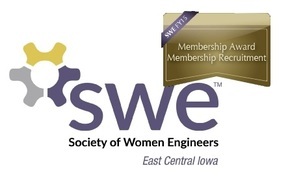 Also keep SWE connected with other SWE local chapters nearby like Quad Cities and Cedar Valley. Helps coordinate at least one joint event with another chapter or society. Attends Core Board Meetings as needed. Organizes 1 professional development event. Helps maintain contacts with businesses and speakers. May help with other professional development opportunities throughout the year. Attends Core Board Meetings as needed (likely those leading up to their event). "The Party Planner" - For those interested in being more involved with SWE-ECI, but not quite ready to commit an entire year to the Core Board. Lead organizer of 1 large event for SWE-ECI (Event TBD at the FY18 Kick Off Meeting). Keeps the President & other Core Board Members updated on progress of planning the event. Asks for help making decisions, as needed. Attends Core Board Meetings, as needed (likely those leading up to the event). Note: Multiple people can hold this position, each for a different event. Interested In Core Board? Take Survey Below! I will send to swe-eci@swe.org by March 31st! I will upload a file with the information now below!